A private deck, a full kitchen, and a wood-burning fireplace... you'll feel right at home in this lovely Oregon Coast cottage! 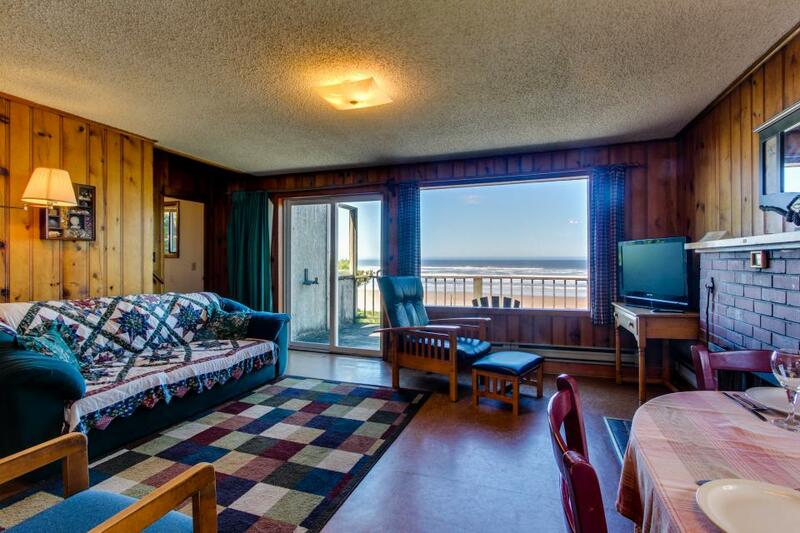 Best of all, that deck directly overlooks the Pacific Ocean: you have beautiful views, and are only steps from the sandy shores of Big Stump Beach! This pet-friendly cottage is part of the rustic and charming Cape Cod Cottages community, just south of the fishing village of Waldport. There are two bedrooms (one with a queen bed, and one with two double beds), along with a full bath, and a cozy living area where everyone can gather around the fireplace. Up to six guests can share this space, along with two dogs - a $10 per dog, per day fee applies, with a $40 minimum per stay. There's complimentary WiFi too, so you can stay connected to the office... or just post beautiful sunset photos during your stay at these lovely Cape Cod Cottages!